Audio Encouragement to Read by Allen B. Wolfe - Intro and Closing Endorsement by Dr. J. Kirk Johnston (turn up volume). This exhortation was given to the brothers and sisters of his home church. Dr. J. Kirk Johnston is the senior pastor of Christ Community Church and author of Why Christians Sin and When Counseling in Not Enough. "Allen Wolfe's study questions were truly a great blessing to me during my first few years as a believer in Jesus Christ because they allowed me to develop a solid background in the Old and New Testament. This study guide encouraged me and allowed me to grow in my personal walk with my Lord. Today, the study aid continues to strengthen and encourage me in the Truth. This two-volume set has been and is a wonderful companion as I study, read, and meditate on God’s Word. The questions are a great way to study the Bible as a whole. Any person serious about studying and learning the Word of God will greatly benefit from this material. Each book study comes with an answer key that directs you straight to the answer. Cross-references point you to other corresponding texts for easy guidance and deep reflection to show the harmony and inerrancy of the Scriptures. Having read many books and study materials as a seminary student, this study aid allowed me to stay grounded strictly in the Word of God. As a singles group leader, the questions were very helpful to me as I prepared for Sunday-school lessons, conducted in-home Bible studies with family and friends, and even as I discipled young Christians. If you want to "be diligent to present yourself approved to God as a workman who does not need to be ashamed, accurately handling the word of truth" (2 Tim. 2:15), then these materials will bless you greatly." "This study guide had an amazing impact on my life. Before I started this workbook, I was a mediocre Christian content with my Bible knowledge and the life I was living. But once I got involved in this study aid, my time in the Word increased and God began to do incredible things in my life! After I began working through this curriculum, God soon led me to a church position and called me to seminary as preparation for vocational ministry. Though I found the training there helpful, my time doing this study was where I learned to love the Bible and where I developed a passion for spending time in the word of God to get the whole picture by reading the Scriptures from cover to cover. When I look back on how the Lord prepared me for ministry, this study had an incredible effect in that process. I would recommend this material to anyone who wants to grow in his Christian life, in his knowledge of the Bible, and in his impact on the world around him. This study impacted my life, and it will impact yours as well." "I believe this guide is a tremendously effective tool for the serious student of Scripture. For those of us who tend not to be rigidly self-disciplined, it helped me to maintain a steady and focused pace of study as I read systematically through the Scripture. In a simple, yet precise and thorough way, it gave me the structure I needed to understand what I was reading, yet I appreciated the way the guide left me alone in the presence of the Holy Spirit to apply the interpretation, to grant me the understanding, wisdom, and comfort of His word as He led me through the reading. The cross references were an especially invaluable tool that enabled me to view the continuity and creativity of God in the myriad ways that He has chosen to reveal Himself throughout the ages. This more than anything, gave me rich insights into how God has weaved the pattern of His redemptive plan throughout all of human history, and continues to powerfully transform my life today. Thank you so much for the all of the time, effort and resources that you have devoted to this project. May God richly bless you for it!" "I grew up in the church and sat through many hours of Sunday school and youth groups, but for some reason I never got around to reading the Bible. I only read a verse here and there, trying to make meaning and sense of what I read, but usually they were just inspirational verses out of context. The Bible was this intimidating, thick book to me. I had no confidence, and I was always relying on someone else's interpretation. Then, when I was in college, I found a Tuesday night Bible study that was using Allen Wolfe's Balancing the Sword study guide. Balancing the Sword has questions that took me through the Bible from cover to cover. There are charts, diagrams, timelines. These really put history into perspective for me. My favorite was the chronology of the kings of Judah and Israel: a timeline in chart form that helped me make sense of the books of I and II Kings. If you're interested in studying the Bible, but you don't know how or where to begin, I encourage you to use Balancing the Sword because it's organized. And it'll help you too. Thank you." "This is Adam Parke. I've been greatly helped by the Bible study material that Allen Wolfe has personally been involved in over the years. It was an incredible turning point in my life. I started getting more serious about God's Word and studying it harder, and realizing all the special treasures that were there especially as one really digs into the Text as the study material allows for, and it's also helped me appreciate the rest of Scripture because, as a lot of Christians, I seem to focus mainly on the New Testament. And it helped me really appreciate the roots of so many different storylines that kind of trace throughout the entire Scripture. And the material is geared such that it forces you really to learn the rest of Scripture instead of just those Texts that have been comfortable for you because they may just be the only Texts that your given pastor may focus on, but it's very unbiased because it's purely set up to just follow along with the Scriptures so equal questions and such happen through different areas of the Scripture versus having questions that are preloaded in different areas. Well, it's been a wonderful blessing in my life, and I sure hope that it's a blessing for other people's lives, so thank you." "Hello, My name is Michael Gobart. I've had the privilege of knowing Allen Wolfe since 1995. Additionally, I'm grateful to say that I've counted Allen a friend since shortly after meeting him. Currently, I work for a Christian book distributor and publisher that's committed to family renewal through the institute of basic, Biblical principals. And this is the very sentiment behind the 'Balancing the Sword' materials. 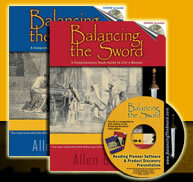 In 1995 when I began participating in the Bible study materials you are currently reviewing or working your way through, it was simply known as 'the Bible study,' and it was presented in a study setting, allowing for interaction and has now blossomed and matured into the formal title of, 'Balancing the Sword,' and Allen's added additional cross-references and illustrations that enhance the overall perspective of each of the passages that we navigate through, as well as the readability and understandability of each of these passages. I'm thrilled to be able to say that I know of Allen's integrity. I know Allen's meticulous approach and diligence in laboring though each and every one of the cross-references that are scattered throughout all of the 'Balancing the Sword' materials. And I know that Allen's done his very best for these materials to be presented as an exaltation of God's Word, not mans' commentary. So that ultimately it's God's Word that speaks to every issue, and the abundance of cross-referencing is an aid, a tool that I highly recommend you utilize. Not just utilizing the questions, but exploring each one of the cross-references that will give you a broader perspective of how God has addressed various issues throughout all of His Word; both Old and New Testament. I'd like to say additionally, that what you are tackling, what you are approaching, once upon a time was considered the most fundamental, the very basic, necessary understanding of the Christian faith, and that is an understanding of Genesis through Revelation. All of the Old Testament, all of the New. We find that our founding fathers throughout many of the founding documents would quote verse after verse and passage after passage as a lot of their daily interaction, through the course of a day with their colleagues. And today we're impressed if a young person is able to rehearse just a couple of verses from the Old Testament. And what a shame that is to the Christian faith! We who bear the name of Christ, should be willing with all that's in us to labor, and labor diligently to study and show ourselves approved before man and God, a workman that needeth not be ashamed. This material is an excellent resource to encourage you through every step of that reading, because there are progressive questions that require you to rehearse what you've just read. And I can tell you from experience that often what you've just read will quickly diminish out of your mind, and those questions are such an excellent tool to call immediately back to memory where it is we're reading through. -What king it may be that we're speaking of; what servant it is that's maybe spoken of, what principle it is that we're seeing consistently and thematically through a given passage. Having said that, I want to encourage you: continue! Continue to labor. Your prize is awaiting, but you must run, and run to win. We as Christians, who again, bear the name of the most holy name - Jesus Christ, the son of God, very God Himself - should be willing to labor in great thrill, in great gratitude, to further understand the mind of God, so we can better appreciate the sacrifice of God, and as He grants us understanding, we mature and are further transformed to bear the mind of God and be a testimonial among the lost people of this world. I encourage you, I exhort you in the name of the Lord to continue steadfastly (Cut 4:33) "Hello, this is Michael Gobart again. I'd like to add a few additional thoughts if I may, that I think are absolutely critical as we evaluate our approach to these Bible study materials and what they provide. These Bible study materials, 'Balancing the Sword,' provide a structure for us to consult God's Word and begin thinking presuppositionally, Biblically. Every single person has presuppositions. Some people approach God's Word as a good resource, but not necessarily ultimate truth. Others approach it with complete skepticism and say that science is really the answer, - presents the answer for all the truth - coming from a framework of evolution or some other model within science or so-called evidence, falsely there called. But ultimately, we must be epistimogically sound. We must have knowledge that is sound, and that can ONLY come from the Lord. Proverbs says that the fear of the Lord is the beginning of knowledge: 'The fear of the LORD is the beginning of wisdom: and the knowledge of the holy is understanding.' If we are going to understand the Lord, if we are going to be His ambassadors, then we must, MUST approach Him with fear. We must approach His Word with reverence. The Bible study materials that you are working through does this. It exalts the Word of God above His name, as the psalmist says, and encourages you to approach the text as the source of revelation, as the point of authority, declaration, and ultimately what you must institute into your life. Additionally, I want you to consider that every single person, no matter who you come in contact with, serves a god. Every single person that you come in contact with serves a god. And in every individual's life, their god is evident. So you must question, 'what god is evident in your life?' Ultimately, if you consult God's Word, if you consult His revelation as the absolute authority, the dictate for your life, the instruction for your life, as you institute that into your life, it will bear its fruit. It will bear evidence that you humble yourself before the Lord, and that you desire to be an ambassador of Christmany Christians throughout the world ignorantly submit themselves to another god. Because they look to government to be an ultimate provision. Or they look to Greek, and gnostic education as the ultimate source of salvation. Or they look to some other provision: socialistic perspective, humanism, evolution. Place ANYTHING in the blank that you desire to; whatever you ultimately are trusting in for your life victory, ultimately it's ____ it is in is salvation. That is your god. What do you worship? Again, to point back to the 'Balancing the Sword' materials, the 'Balancing the Sword' materials will continue to point you back to Scripture as the ultimate elevated source of God's revelation, and the ONLY source of God's revelation. As you mature, as you pray, as you commit yourself to the Lord Jesus and you diligently labor through His Word, you will be transformed. Your mind will be transformed, and you'll more effectively be an ambassador for Christ in this world. You'll be able to encourage God's people; you'll function as a part of the body. And that must come of understanding. Far too long is the day for Christians to be ignorant because of a lack of understanding of God's Word. This material is a guide to assist your examination and retention of God's Word, and I hope genuinely for God's greatest blessing as you continue to labor, as you continue in your commitment to the Lord through the study of His Word."